First match coming up.... Help me be ready! Looks like I have a match coming up, that's more or less local, and I have a day free! OK, so Ive been reading up... but Im still pretty lost. It looks like I will just be shooting .22. Between ammo, and hardware issues my 45 is out. I do have a model 19 revolver that I can shoot centerfire with though.. Does it make since to shoot .22, and CF, but not 45? What will I need to bring? I see it lists a .22 Caliber 2700 Aggregate match. Ive never read about that before. How does it score compared to the 3 gun match? If you just shoot the .22 in a normal match how are you scored? Any help would be great. Im a little lost, and Im sure the first time will be a little crazy, but if I can at least be semi prepared that will ease things. Re: First match coming up.... Help me be ready! You will have plenty of time to adjust sights in slow fire, however, I rarely adjust my sights on the 22 between 25 and 50 yards. Most people at our club are done with slow fire in 5 minutes, so 10 gives plenty of time for sight adjustment and even a few dry fire shots before you really get started. Well I went to the range and get some shots fired of the ammo I'm using. I have two high standard pistols. A 104 citation and a 103 tournament that has a Victor barrel on it. Tried them bolth out to see what one I should shoot. Bolth shot the ammo well but the 103 grouped a little tighter so it won out. I should do ok, but I'm sure the mental aspect of the unknown will effect my scores. Please put your "scores" out of your mind for the first few matches. It is now, and always will be a detriment to your shooting skills. At this point, you're trying to develop shooting skills, not win matches. After some seasoned practice, you'll know and feel when the shot is good or not without looking at the target. For now, forget each shot as soon as it is downrange- "Fugetaboutit"! The next shot is the only one that should be on your mind, as it's the only one you have control over. I retired my HS Series 103 Sharpshooter when a Hammerli 215 came my way. Also have a Texas Victor, but the slant grip Sharpshooter, with a Volquartsen barrel, is a joy to shoot. Ya I know. And I'm pretty good about just making each shot its own, and not sweat the past. Ya I really like the slant grip HS pistols. They just feel right to me. Dad shot with the same gear 40+ years ago. It will be nice to get the gear back to the line with me pulling the trigger this time! Well the first match is in the books!! Had a great time. I got to meet Jwax, and him, and everyone else went out of their way to make me feel welcome. Many tips, and tricks were coming my way all day. and I was never made to feel like I had a dumb question when I asked. The bad... Well I was sick as a dog most of last week. Not being able to really eat much, and a lot of time down for the count. That left me pretty weak and tired. I really felt it the second match. Lots of sight wobble I normaly don't have. [first match jitters doesn't help either ] After a break for lunch I was doing better, and I think I shot better. I also forgot to write down my scores... not a huge thing I guess... With all the hubbub it just sliped my mind. The good.. I learned a LOT!!! After shooting the match, I have a list of things I need to work on, and train to improve. Most of my shots were real high. Could be a sight adjustment.... but I think its me. Ill work on that for sure. I also need to do some more dry firing to work on building the strength, and trigger control. I also want to try different grips. Im running the stock grips and after a bit they were feeling a little thin, and small for my hands. So I have a lot to work on, and I cant wait till my next match!! Any new guy reading this, all I can tell you is to jump in and give it a try.. Many helpful people at the matches will help you if your not sure what your doing!!! Knowing your scores is a mistake for most shooters. Wait for the match results to come out. 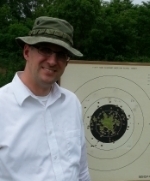 Rob Kovach wrote: Knowing your scores is a mistake for most shooters. Wait for the match results to come out. Ya I wasn't that worried about the scores. I was more interested in seeing where the placement was. A lot of pasters got used. I did have at least one target where I did not need a paster.... I was happy with that. One good thing was the old High standard with countless thousands of rounds through it worked awesome, and without a hiccup!! The old girl is almost ready for a AARP card and still trucks along! s1120 wrote: Well the first match is in the books!! Yup, this mirrors my experience as well - the newbies are often offered a lot of advice by the old hands. You might actually shoot better while sick. I find that generally the case for me -- my physical misery tends to mute all the other thoughts in my head and I seem to focus more on the fundamentals of shooting well. I've won matches while coughing and sniffling between shots/strings (and even once while my arm and leg were still 'dripping' from huge patches of road rash from crashing on my bicycle the day before). s1120 wrote: After a break for lunch I was doing better, and I think I shot better. Nutrition definitely matters - bring some snacks and water bottles (and maybe even a small cooler) to your next match; keep them nearby. s1120 wrote: I also forgot to write down my scores... not a huge thing I guess... With all the hubbub it just sliped my mind. Not really a big thing, but it's good to know at least whether the scores you're adding up match the ones that your scorer is putting on your scorecard. Also, you can figure out your aggregate scores and get a sense of how you shot (compared to yourself in past matches...now that you have a match under your belt). s1120 wrote: The good.. I learned a LOT!!! After shooting the match, I have a list of things I need to work on, and train to improve. Most of my shots were real high. Could be a sight adjustment.... but I think its me. Ill work on that for sure. I also need to do some more dry firing to work on building the strength, and trigger control. I also want to try different grips. Im running the stock grips and after a bit they were feeling a little thin, and small for my hands. It definitely sounds like you had fun and learned a lot. I can't wait to read your next match report! More matches the better Paul! I think the next Castleton is Sept. 13/14, but have to check on that. Duchess County Pistol Association (DCPA) has the NYS match Sept. 7, if you want to make that trip. Nice to meet you Paul, hope to see you at the next match! BTW, Castleton will snail mail the final scores for everybody in a week or two, so keep a look out for that! i figured they might do that. they emailed me for my address. dont think i can pull off the duchess county one. my next few weeks are packed!!! i am going to try to fit in the castlton one. i have enough ammo for one more match, and some training this year. hoping the 22 crisis eases befor next year so i can re stock up.